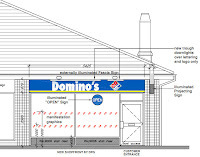 Update (21 Aug 2011): Opening Hours for this store: Domino's Kenilworth - open every day at 10.00 am closing at 11.00pm apar from Fri and Sat: open until midnight. For orders, call 01926 856888. (Note: Will check when the store opens officially). 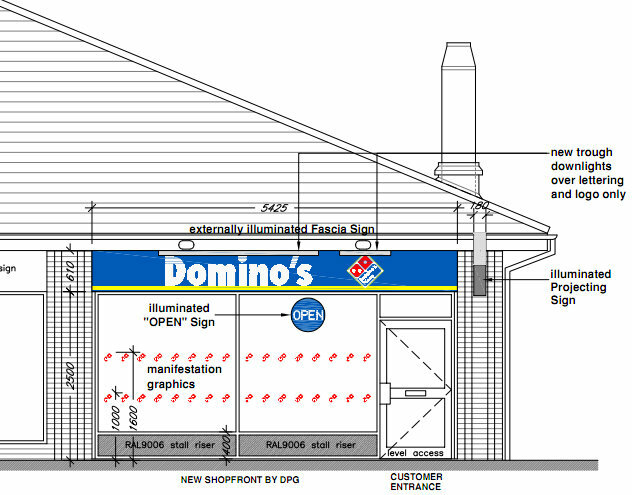 What do we know about Domino's Pizza coming to Leyes Lane in Kenilworth? Here's a run down of all that I've found out about the issue. The local KWN (Monday 8 August), in a lazy advertorial churnalism post, merely stated a few facts, but there is so much more to it than that. Why is this newspaper not asking proper questions and bothering to investigate a story with hidden issues? 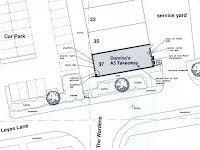 It all started with a planning application to WDC on 9 May 2011 (W/11/0594) where plans for new signs were proposed. I assume there was no change of use as the shop unit was already trading as take away food. Permission was granted on 26 July (with two objections from local residents, but none from Kenilworth Town Council). There was no mention of Kenilworth School and their reaction to the proposals. News at the end of July before the school term ended was a new catering company (Innovate) were to initiate serving healthy meals for the students. This will be the first time finger print scanning will be used and the students need no money in their pockets. Parents will also be view their child's lunch time meal on the internet. This must be a fantastic move for Kenilworth School. 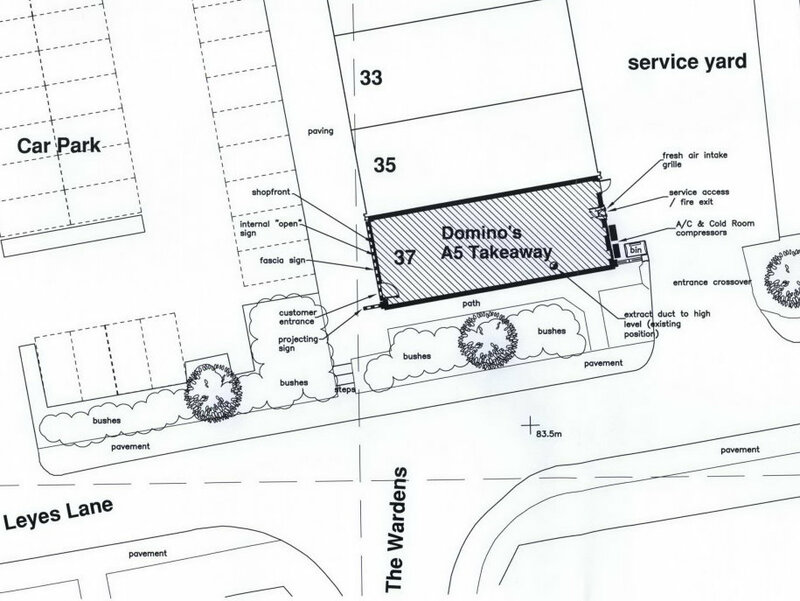 So what can we expect of Domino's Pizza in Leyes Lane? The closest outlet in Warwick serves food from 10.00am to midnight, 6 days a week (11pm on a Sunday). The Coventry store is open until 5.00am seven days a week. Domino's is the third American brand now in Kenilworth after Starbucks and Subway. Does this mean that McDonald's, Pizza Hut, Burger King and Kentucky Fried Chicken are also welcome should they apply? Finally, can I draw attention back to The Kenilworth Weekly News for producing an article that raises no questions that such a recognisable brand takes up a position opposite the only secondary school in the town. If the local paper produces free editorial adverts (like this one) - it should clearly say so. UPDATE Thurs at 4pm: KWN have updated their web edition of this story by saying another article is coming and not everyone is happy about it. What the pizza place, the earlier article or both? Footnote: Here at wiK, it is not our intention to point fingers at what we do not like and tell the world, but rather is to look at a larger picture and see where we fit in. And if that means, we can provide something useful and unique - then we have a place at the table. If you bothered to read the Kenilworth Weekly News today (Friday) you would see that it has done a full, comprehensive and balanced story on Domino's Pizza coming to the town. Thanks for this comment. I was responding to what the KWN published on Monday 8 August. So, although I have read the KWN today and updated this post with a link, when I posted yesterday, Friday's KWN was not published. As for 'full, comprehensive and balanced' - then I disagree. I say this as taking a few lines from the press release, reading an objection from the planning application and calling that an article is not a story (in my view). What I expect from new gathers is to ask hard questions and find in depth answers. And as for the KWN deleting their online Mon 8th article following the wiK post is ridiculous. Johnston Press and the KWN and Courier have a difficult job in this digital age. But, there is no reason the public should miss out on news delayed for up to 9 days just because the print edition publishes on a Friday and the website will not be updated in the meantime. "Hard questions and in depth answers?" I think that's a bit over the top for a story of this nature. I would also like to point out a blatant contradiction in your post. At the bottom you say: "Here at wiK, it is not our intention to point fingers at what we do not like and tell the world, but rather to look at a larger picture and see where we fit in." But yet at the top of the post you say: "The local KWN (Monday 8 August), in a lazy advertorial churnalism post, merely stated a few facts, but there is so much more to it than that. Why is this newspaper not asking proper questions and bothering to investigate a story with hidden issues?" That sounds like finger pointing at what you don't like to me. But in your defence you haven't told the world, as I doubt this blog can claim to have that many hits. Once again thanks for the comments. It's a pity you do not leave your name on your comments. But that's fine. For your information, if all the worlds websites where simplified to be equivalent to 1,000 then whatsinKenilworth.com would be a number 4th from the top. In preparation, I will be posting on how Johnston Press titles are leaving small towns, striking and even being paid in free online bingo. In my view, Kenilworth could be left without any newspaper at all. And that would be a real shame for the people. Print journalism is shrinking very fast, more rely on social media for stories and the KWN and Courier need to change with the times. That is not anyone's fault locally, but at JP board level. And I am in touch with people from the NUJ and understand these difficult times across newspapers, radio and television. If all the world's websites were simplified to be equivalent to 1,000 what? And if that is the case,and you are 4th from top, could you please tell me which of the above websites are below wiK on the hits list? I'm happy to provide what I know. I blogged at http://www.themikedownespage.com/2011/07/how-many-global-websites-are-there-and.html about how many active domains there are in the world. Like for like website comparison is hard to measure, I have based it on alexa.com http://www.alexa.com/siteinfo/whatsinkenilworth.com# where wiK is ranked 453,023 (globally) out of 108,000,000 active sites. wiK is between 14-14,000 in the uk. Large numbers, so that's why I used a metric that simplified to 1,000. So, yes all of Google, eBay etc are ranked much higher than wiK, just go to alexa.com and enter any site - if the site is large enough, then you will get the data. But, the KWN http://www.alexa.com/siteinfo/ajobtoday.co.uk# views as a newspaper from Hastings, try it yourself. Where the Courier does show a true web domain: http://www.alexa.com/siteinfo/leamingtoncourier.co.uk# 1,220,717 global and 69,191 in the UK. Similarly, Warwick Courier 2,457,481 global and 211,143 in the UK. So, in conclusion, albeit one metric, for a like for like a league table can be drawn up. And of course, if you have some better way to collerate the data, please let me know. I do actually have a better (and much simpler) way to collect the data, which I believe may already be in use. Just count how many unique user hits each website has. Yes, I agree, but there is no way of knowing each website's unique viwers unless your have access to or own the site. So, if you know a way, then please share. There are tools like: http://www.trafficestimate.com/ but they can only arrive at data from very large sites. This doesn't tell me anything about when the grand opening is!